The Adelaide Memorial Church of Christ the Redeemer is an architectural gem. Its origins are traced back to a love story which ended in tragedy. 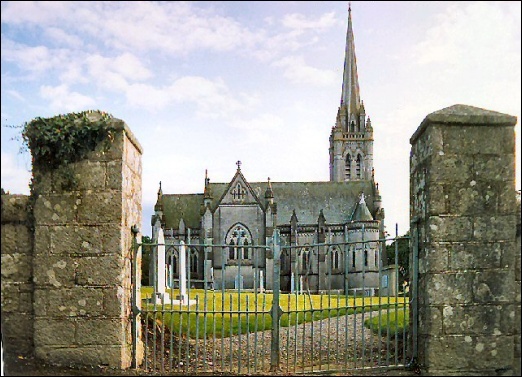 It replaces an earlier Church of Ireland building dating from 1811. Miss Constance Eugenie Duguid, a daughter of an English businessman, visited her sister in 1887 at her home in Myshall. Her sister was married to the curate of Fenagh and Myshall and resided in Myshall Glebe. Constance became engaged to a member of the Brady family who lived in Myshall Lodge but before the happy event took place she was thrown from her horse and died soon afterwards. She was buried in the hillside churchyard close to the mountains and open countryside she loved. Later her parents erected over her grave a marble copy of a statue of Innocence which she admired when on holidays in Italy. A few years later her mother died and by her wish was buried alongside her daughter. 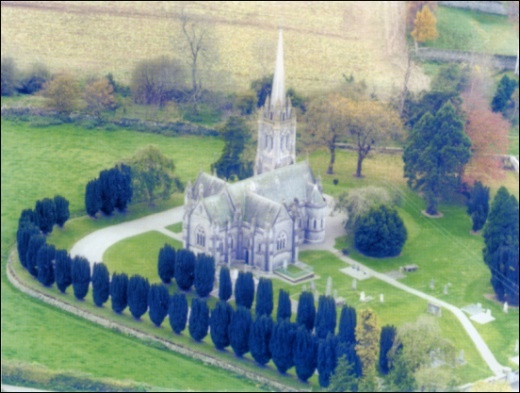 The white marble statue reacted badly to the Irish weather so Mr. Duguid decided to build a church that would not only be a shelter to his daughter’s monument but would also serve as a memorial to his wife. The remaining ten years of his own life were spent largely in completing his “memorial of love”. He died in 1912 the year before the church was consecrated. 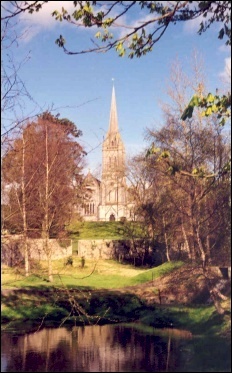 The Church is designed after the style of Salisbury Cathedral and the architect Ashlin, of Dublin also designed the Roman Catholic Cathedral at Cobh, Co. Cork and Ardilaun Memorial Church at Raheny, Dublin. The exterior is of limestone above a five foot base of polished granite. The church is finished with an ornate tower and spire. The interior of this church contains a multitude of features of interest for their craftsmanship, design and the material employed. Wood carving, marble, mosaic, ironwork and stained glass are all used effectively and one of the wonders of the interior of the building is that an impression of church art run riot is avoided. One of the most interesting features of this church is the stained glass, some by the renowned Irish artist, Eve Hone.